Dea Augusta is the name of a Celtic River goddess. Very suitable given my Scottish heritage and this gorgeous water dog. We call her August, and think of her as our birthday girl. I contacted her breeder Celine Soulier in France on my birthday and brought her home on my husbands birthday. She is a stunning girl. Must get it from her parents who are both French and International Champions. In 2009 her father (Veltliner) was the Best of Breed at the French National, there were 35 Barbets at that show. Her mother Rebecca de Winter is a French and Italian champion and an excellent huntress. August began to show in the summer of 2009. In a limited number of shows she became a Canadian Champion. This included her first group placement at eight months and a Best Puppy in Show at eleven months. 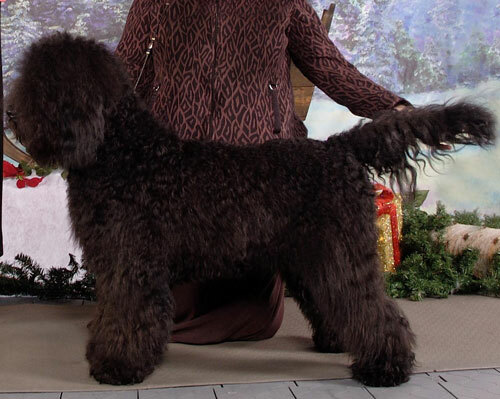 She was the number one female and number two Barbet in Canada for both 2009 and 2010. On February 2, 2011 August brought seven beautiful Barbets into the world. I could not have asked for a better start for the first TreeBeard litter. This beautiful girl is the puppy I kept from our first TreeBeard litter in February 2011. That year was the letter G” for Barbet names, if you follow tradition. Her CKC registered name (TreeBeard's Galapagos Girl) is in honor of her dad Darwin. Darwin, the real one, developed his theory of evolution in the Galapagos. We call her Hazel. In her first show in August 2011 at six months she was awarded Best Puppy in Group. A picture from that first show is above. Hazel became a Canadian Champion at nine months in four weekends and received five Best Puppy in Group placements in her first three weekends. Hazel continued to have success in the ring in 2012 and 2013. 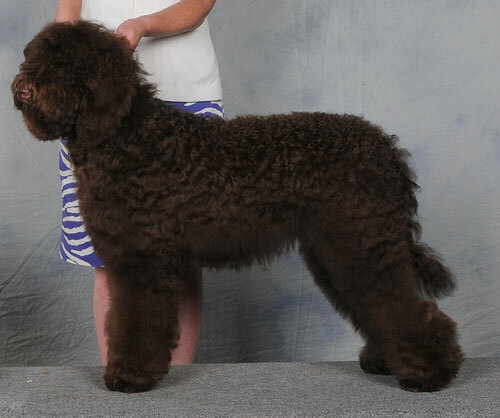 I am thrilled with the accomplishments of this young girl whose official name is CAN GCH, FCC CH, UKC CH TREEBEARD'S GALAPAGOS GIRL. 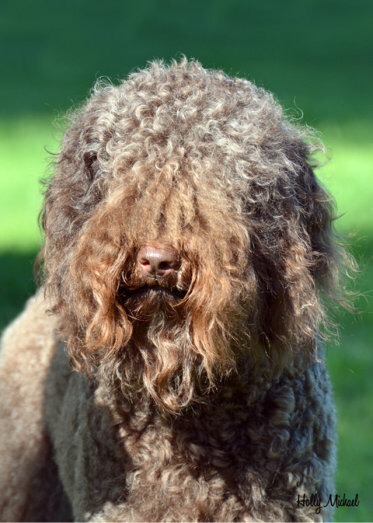 This multi group winning girl is the first female Barbet to become a Canadian Grand Champion (her dad Darwin was the first and then the first Grand Excellent). A FCC Champion, with 3 of the 4 required CACS's for her FCC Elite. And a UKC Champion qualifying in the top ten for 2013. In October she was awarded a Group 2, and a Group 3 in a two show AKC FSS weekend in New Jersey. To have this recognition from so many qualified judges in these various shows, and to achieve a championship in three recognized institutions is a true honour. She has wonderful traits from both parents (August and Darwin), who she delights in chasing. And such a gentle and playful character. 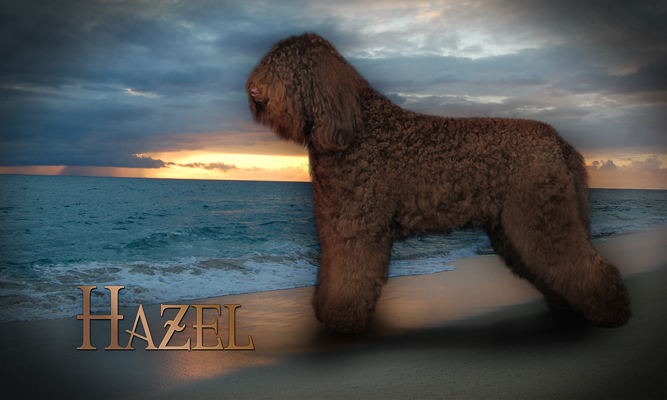 We look forward to Hazel's first litter in 2014.